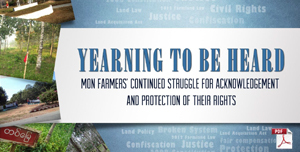 Over the years HURFOM has produced a number of accounts highlighting the hardships faced by Mon farmers who became victims of land confiscation or unjust land acquisition. In this report HURFOM follows-up on previously documented abuses and concentrates on an emerging new trend: farmers’ active and collective pursuits for rights to their land. For Full report, please view HERE. 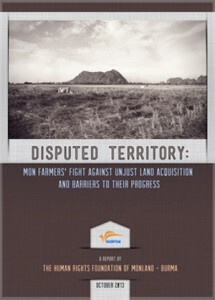 Disputed Territory aims to elaborate on the activities of and express solidarity with farmers who are resolutely, and in some cases for the first time, seeking justice regarding their land. 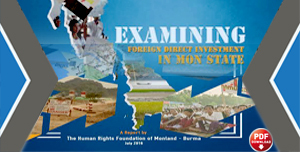 To exhibit current challenges and bring into focus some of the key obstacles in the Mon context, this report uses case studies of appeals over past military land confiscations in Ye Township and on-going transgressions by various investors in Kyaikmayaw Township. HURFOM contends that farmers’ newly voiced demands present an important opportunity for President Thein Sein’s government. Inherent in an environment of growing activism is the chance to meet appeals with justice, thereby demonstrating to domestic and international critics that the administration is committed to a clear break with the abuses of past military regimes. Violations of farmers’ rights need to be publicly condemned and owners of wrongfully seized land must have property restored or be given fair compensation. There is an urgent need for the establishment of a credible legal framework to prevent dispossession and violated rights from continuing to be hallmarks of agrarian life under this government’s nominally civilian rule. The argument presented herein is simple. Since 2011 farmers have been actively pursuing their rights to land, yet to date little progress has been made. 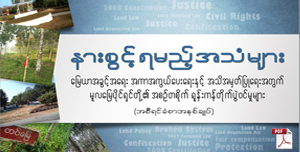 Few past victims of unjust land acquisition have had land returned, misconduct by investors in land acquisition continues, and secure land rights remain virtually absent from Burmese law. Inadequate legislation and public lack of awareness of existing legal rights are highlighted as key reasons why Mon farmers do not possess rights to their land in 2013. In a nation emerging from conflict and actively pursuing economic development, farmers are in desperate need of robust, legally enshrined protection of their land rights. With government land surveys characterised by a lack of transparency and enduring bias, the precise number of acres of land unjustly acquired from Mon farmers over the years remains nearly impossible for an organisation of HURFOM’s capacity to confirm. However, information gathered for this report suggests that it stretches to tens of thousands of acres. 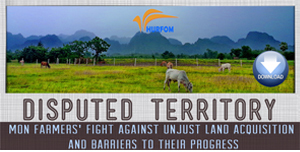 HURFOM calls on all persons in positions of authority to elevate the voices and champion the rights of farmers who for generations have crafted Burma’s unique and prolific landscape. Since 1995 HURFOM has been engaged in documenting the voices of Mon populations with research methodology that was developed over these 18 years of experience. 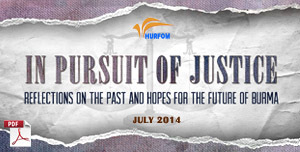 In addition to new materials collected, this report includes information, testimonies and images from HURFOM’s extensive archives. Research for this report was conducted from April to September 2013. During this period five field reporters visited four Mon-populated townships: Mon State’s Ye, Thanbyuzayat and Kyaikmayaw townships, and Tenasserim Region’s Yebyu Township. Interviews were conducted in person where possible and by phone when transport or security issues made interviewees’ locations inaccessible, and field reporters shared interview transcripts and field notes with HURFOM via satellite phones and online communications. With local authorities often backing the military personnel and companies involved in cases under investigation, field reporters noted they had to carry out research with caution. In total close to 100 interviews were conducted. 83 local residents were consulted in Ye and Kyaikmayaw townships and seven in Yebyu Township. In Ye Township 14 villages were covered, whilst testimony was obtained from residents of five Kyaikmayaw villages. In addition, field reporters consulted four members of the Settlement and Land Records Department, two parliamentary representatives (both members of the Land Investigation Commission), five members of village administration, one Union leader and numerous legal experts. Where possible HURFOM uses the real names of interviewees, although many requested to remain anonymous or to appear under an alias given security concerns related to their cases. Over the course of this research, various persons declined to talk with HURFOM reporters. Some victims of military confiscations in Ye Township expressed distrust for our reporters, saying they would only cooperate with political parties. Of 12 civil servants who declined interviews, two said they were concerned about farmers’ rights in on-gong land disputes but feared that giving testimony might jeopardise their positions. 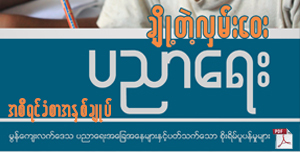 All companies active in Kyaikmayaw Township refused requests for information. In addition to conducting interviews, HURFOM was able to obtain copies of correspondence regarding land disputes in Ye, Kyaikmayaw, Yebyu, and Thanbyuzayat townships. These contained both original letters of appeal from residents and responses by government personnel. Attempts to confirm cases in Ye revealed to HURFOM the challenges faced by agents investigating land disputes. In some villages it was difficult for reporters to accurately track the chronology of land ownership due to sale, rental or re-confiscation of land. It was also noted that land acreage and the number of agricultural assets (trees or plants) involved in confiscations proved difficult to confirm due to falsified military records, deficient land documentation, inflated claims by victims hoping to secure more compensation, and human error when remembering exact circumstances. Under military rule various factors conspired to bring about large-scale military confiscations of land in Ye Township, located in the south of Mon State. These confiscations primarily took place after 1995 following the ceasefire between the New Mon State Party (NMSP) and Burmese military forces. As a zone newly accessible to the Burmese military and on the route of the Kanbauk to Myaing Kalay gas pipeline, Ye Township saw a surge of military battalions deployed to the area and subsequently seeking land. Reports published by HURFOM in 2003 and 2009 together indicate over 6,000 acres of land confiscated by the military in Ye township from 1998 to 2009. These and more recent HURFOM articles have reported land confiscations over this period in around 30 towns and villages in Ye Township at the hands of over 20 different, identifiable military groups. Many of these were large-scale acquisitions; for example, 360 acres confiscated in Ayu Taung village by Light Infantry Battalion (LIB) No. 343. Most plots of land were seized for direct use by the battalions, although in some cases land was confiscated on behalf of government departments. Often the fact that land was unregistered and officially classed as ‘vacant’ was used to justify failure to compensate land or the crops growing on it. In addition, residents were frequently coerced into signing compensation agreements that were used to give an impression of legitimacy to military land acquisition. To put that sum into perspective, at the time 100,000 kyat was roughly equivalent to a third or half of the profits generated from one durian harvest on a plantation of that size. Although larger sums of compensation were offered to certain other residents in the area, the extent of the undervaluation of land that is central to providing families with income year after year is apparent. Today Nai Khin Mung Nyit’s plantation is valued at 10 million kyat. Victims of previous Ye military confiscations were revisited by HURFOM in 2013 and each reported losing between 2 and 40 acres of land with little or no compensation provided. Sums of compensation recorded were as low as 563 kyat for almost seven acres of land. Situated in the east of Mon State and bisected by the Attaran River, Kyaikmayaw Township is straddled by the Ni Don and Pyar Taung Mountains. For residents, these peaks signify the legacy of their ancestors, with caverns and mountaintops strewn with ancient pagodas, cave paintings and religious artefacts. For investors, the mountains’ value lies below, in the resources beneath these elaborate adornments. A previous employee of the Ministry of Mines estimated that 200 million tonnes of limestone, a vital raw material in cement production, was contained in Ni Don Mountain alone. The mountains also contain a plentiful supply of coal, needed for firing production facilities that convert earth into saleable product. Plans for heavy cement production in the region reportedly began in 2006 with negotiations between Hexa and the ruling Union Solidarity and Development Party (USDP) exploring collaboration and profit-sharing from the enterprise. The project was to cover both Ni Don Mountain on the western side of the Attaran River and Pyar Taung on its eastern bank. Hexa’s plans never materialized, but were swiftly replaced by numerous other domestic companies competing to capitalise on the township’s untapped natural resource. Residents in Kyaikmayaw Township first learned of these plans in 2009, not long before government servants, local administration and company officials arrived to survey land in October 2010. Land acquisition began immediately, with 99 farmers signing their plantations over to Zaykabar by the end of December 2010. Ni Don residents reported that Zaykabar also acquired around 2,000 of acres of land to construct a road linking future cement supply with nationwide demand. Meanwhile, on the eastern bank of the river, 24 Hour General Services was replaced by the June Industry Co. Ltd., a bio-fuels company with a branch focussed on cement production. Again, land acquisition began at once, with 311.36 acres signed over to the company by the end of February. Two years later, in January 2013, a new company arrived in the area to establish a cement plant near Pyar Taung Mountain, directly competing with the June Company and compounding pressure on eastern bank residents to sell their land. One resident reported in August that the new arrival, Pacific Link Cement Industries Ltd. led by retired military captain Zaw Lwin Oo, had acquired around 300 acres of land for the project. Research conducted by HURFOM demonstrated rife misconduct throughout all companies’ negotiations with Kyaikmayaw farmers in 10 affected villages. Compensation offers were reported to be far below the land’s market value, companies showed no commitment to seeking free, prior and informed consent from residents in land acquisition (even using threats and deception to gain land), and to date compensation payments have not been received in full by many residents. Despite new legislation passed in 2012, the law offers insufficient protection and limited rights over land to farmers facing unjust land acquisition. The 2012 Farmland Act offers weak land security for farmers, with forcible acquisition of land for State purposes continuing to be endorsed. Legislation does not make due effort to ensure that, in line with international law, State rights to acquire land for public purposes are not abused. Ye government ministries used the law’s weak land tenure security to vindicate past military seizures of land and avoid satisfying residents’ demands for land restitution or fair compensation. In Kyaikmayaw Township threats were made by various investors about forcible land acquisition for “State projects”. Whether or not these were grounded in fact, they had credibility because by law consent need not be sought in such cases. If “State project” claims prove genuine, Kyaikmayaw residents are left with little legal basis for land restitution demands. Whilst by law compensation must be paid, lack of guidelines on this leaves residents without guarantee of payment to the market value of their land. Farmers lacking currently valid legal documentation for their land are made vulnerable to forced acquisition by the 2012 Farmland and VFV Laws. In Ye Township laws allowing State-sanctioned acquisition of formally unregistered land were used by government departments to vindicate past military acquisition of land for zero compensation. As a result residents’ claims for compensation regarding land and destroyed plants were denied. In 2013 the Pacific Link Co. Ltd. in Kyaikmayaw Township reportedly failed to seek residents’ consent to sale and sought out land susceptible to acquisition in Kwan Ngan village that had been cultivated for decades but was not covered by official Land Use Certificates. Farmers’ appeals for justice have been hindered by the fact that, by law, there exists no impartial body to adjudicate their complaints. The Land Investigation Commission is largely limited to fact-finding and in both Ye and Kyaikmayaw townships, Mon farmers’ appeals were investigated and decided by members of government departments and local administration offices that were often complicit in the abuses in question. In Ye, SLRD officials’ inaccurate surveying of confiscated land showed that impartiality and justice for past military confiscations could not be secured where investigation is delegated to local authorities. Similarly, government correspondence sent in response to appeals revealed biases in decision-making, and ministries that initially ordered or benefited from confiscations unsurprisingly endorsed past land acquisitions. In Kyaikmayaw investigations into unjust land acquisition perpetrated by private companies were carried out by government servants and local administration members who were implicated along with investors in attempting to coerce or force residents off their land. Although results are still unknown, the impartiality appeared unlikely. With decision-making on land disputes currently centralised, the importance of government commitment to endorsing responsible and just land acquisition is paramount. State condemnation of and restitution for unjust land acquisition is a pillar of international law and a pre-condition for a political system committed to protecting its people’s rights. In Ye government ministries failed to condemn past military confiscations of land, instead relying on law to vindicate these seizures and resist reparations. Although some confiscated land that now lies fallow is slated for return to its original owners, no condemnation was made of the initial seizure. Kyaikmayaw farmers expressed concern that they had been left unprotected from misconduct by a government that privileged the interests of investors and tolerated or encouraged unjust land acquisition. Few actions have been taken to publicly acknowledge, condemn, or punish misconduct by cement companies active in Kyaikmayaw, nor to regulate their conduct in the first place. Many farmers were never exposed to adequate information about their legal land rights or the repercussions of selling land under market value, and therefore faced significant challenges when confronted with land disputes. In on-going cases investors were noted to have openly taken advantage of these conditions, along with frequent language barriers, to acquire land for unfair prices or with coercive techniques. In Ye Township a letter of appeal stated that many victims of military confiscation had not known the laws applicable to their case at the time and emphasised that farmers needed training to ensure that they understood the rights granted under current law. Although the law offers them weak protection, it is likely that many Ye farmers would benefit from realizing their legal entitlement to fair compensation for State-purpose land acquisition. Also, SLRD members surveying land confiscated by the military in Ye Township communicated with farmers only in Burmese, denying them the opportunity to fully state their cases in Mon language or engage with the survey process. In Kyaikmayaw investors exploited residents’ lack of legal knowledge by citing the State’s involvement in the project and threatening forcible land acquisition without compensation if the landowners refused to comply with company compensation offers. For landowners that held official land documentation, these claims of State authorisation would not supersede the legal requirement to provide fair compensation. However, many residents were unaware of this and forfeited their land for a fraction of its market value. Company representatives also spoke solely in Burmese to Mon farmers and in this way failed to seek fully informed consent. There is an immediate need for all persons in position of influence to effectively advocate for farmers’ rights where they cannot fully pursue their own. Far from advancing Mon farmers’ rights to land, government departments and local-level authorities have frequently exhibited poor conduct by collaborating with perpetrators or endorsing injustice. Mon political parties and ethnic Mon resistance groups, particularly the New Mon State Party (NMSP), must dutifully commit to advancing the claims of all victims of land-related injustice. In Ye Township bias was seen in the way appeals were handled by the Ministry of Defence, Ministry of Home Affairs, and the Settlement and Land Records Department (SLRD), all reportedly tied to perpetrators of past military abuses. In Kyaikmayaw Township members of the SLRD and local administration were alleged to be accepting bribes and documented as having collaborated with companies to assist them in acquiring land through unjust means. The NMSP’s 2012 ceasefire agreement prioritises a number of political concerns but is weak on the promotion of Mon farmers’ rights to land. This is particularly relevant to past Ye Township military confiscations since reparations for these widespread abuses must become a central part of the peace process. The Burmese government has an important responsibility in this regard as international law stipulates that land restitution procedures, institutions and mechanisms be included in peace agreements. However, significant efforts by the NMSP are required to push for this outcome. In terms of individual armed group members’ conduct, in Kyaikmayaw Township residents felt that members of Mon armed groups had failed to protect them from unscrupulous investors. It was voiced that they had instead tried to appease companies, attempting to ensure the security of their own land. To reform laws laid out in the 2008 Constitution (Article 23) in order to protect farmers interests and offer legal recourse in cases of unjust land acquisition. To establish clear and just guidelines on State acquisition of land, fully detailing necessary pre-conditions and outlining mechanisms for deciding on fair compensation. To recognise by law the rights of farmers holding land in accordance with customary law. Failing this, for the government to take efforts to streamline the formal land registration process and support all landholders to obtain LUCs. To appoint an independent and transparent judicial body to investigate and decide on cases of unjust land acquisition. The Land Investigation Commission’s mandate could be widened, or a separate, fully impartial body created and assigned decision-making powers. All investigation and decisions made to date must be reassessed by this body to mitigate the effects of bias in the handling of appeals. To publicly condemn unjust seizures of land under the previous military regime and ensure that, in compliance with international law and as part of the peace process, land is restored to victims or fair compensation paid. In particular, the government must recognise the demands of international law for actors in post-conflict settings to, “Establish and support equitable, timely, independent, transparent and non-discriminatory procedures, institutions and mechanisms to assess and enforce housing, land and property restitution claims,” bringing about concrete results for farmers in a swift and fully transparent manner. As a matter of urgency, the Ministry of Defence must ensure that land currently unused by battalions is immediately returned to its former owners. To publicly acknowledge, condemn and punish all cases of misconduct by investors acquiring land in Mon areas. To set a no-tolerance policy for unjust land acquisition perpetrated by companies that ensures conduct is thoroughly regulated. To follow responsible conduct in land acquisition, ensuring that free, prior and informed consent is sought from all parties and fair compensation for land paid. Where appropriate, investors must make efforts to include Mon language speakers in the process of negotiation with farmers. To commit to full transparency in all projects undertaken. In this regard for the Zaykabar Co. Ltd., Pacific Link Cement Industries Ltd., and June Industry Co. Ltd. to disclose whether their projects are in fact genuine State projects, and if so, detailing (1) permissions granted to acquire land and (2) project timeframes listed in permissions. If no State permission was granted, or projects have been terminated or timeframes exceeded, then in line with Farmland Act (2012) Article 32 land acquired without free, prior and informed consent must be restored to Kyaikmayaw residents immediately. To eliminate corruption and complicity in unjust land acquisition. Full commitment to protecting farmers’ rights must be demonstrated at all points of the process, whether personnel are involved early on with land acquisition negotiations or later when investigating or adjudicating appeals. To cooperate completely with the Land Investigation Commission’s inquiries and exhibit to local residents that disclosing abuse will not be met with reprisals. To show full and genuine commitment to (1) championing the rights of Mon farmers throughout the peace process, (2) advancing appeals on farmers’ behalf, and (3) furthering the rights of Mon farmers in the wider national dialogue on land rights. To make concrete efforts to enhance farmers’ capacity to handle land disputes, particularly by offering accessible legal counsel and financial skills trainings. 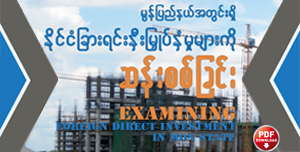 To cooperate with investigations of land disputes and provide honest and accurate information. To call on Thein Sein’s government to more fully commit to protecting the rights of farmers in cases of land acquisition. To promote responsible conduct by all foreign investors active in Mon regions, in particular with regards to Siam Cement Group’s plans to establish cement production in Moulmein, the capital of Mon State. “Unjust land acquisition” is used throughout this report in reference to acquisitions of land in which landowners’ rights are not respected. Typically this involves the failure to obtain free, prior and informed consent for the acquisition, and may also include failure to pay compensation or payment of compensation below the land’s market value. The term is used broadly, to encompass past cases of military land confiscation and on-going acquisitions of land by unscrupulous investors. HURFOM, No Land to Farm, 2003; HURFOM, Laid Waste, 2009. HURFOM Interview Y11, Kundu village, Ye Township, August 2013. HURFOM, ‘‘When I became desperate’: Opinions of residents during forced land acquisition in Kyaikmayaw Township’, 18 January 2011. HURFOM FR K2, August 2013. Letter from Kaw Pa Naw residents to various government departments, 23/04/2013 (Source K2). HURFOM Interview K7, Kwan Ngan village, August 2013.